I’ve been working with JumpStart for over a year now and it has been quite exciting to see them progress and grow and move from on-line/computer gaming to the Wii. 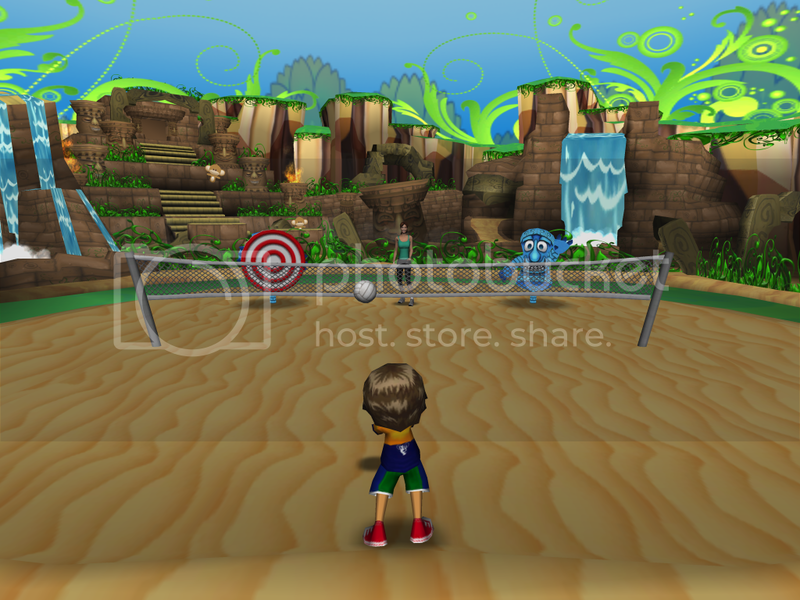 JumpStart is an award-winning adventure-based 3D virtual world that is super-personalized, wildly imaginative and really fun, but don’t let that fool you – it also teaches math, reading, and critical thinking skills so kids get a real jump start in life. They recently sent me their newest game JumpStart Get Moving: Family Fitness. The game will be in stores June 15th and it will be sold for $29.99. It has been rated E for Everyone with Comic Mischief by the ESRB. We put it in last Friday to give it a test. The graphics immediately pulled Zoe and Miles in. They each wanted to play so I gave them a controller. We created avatars for each of them and I let them pick out all the colors. So of course Zoe was as purple as she could possibly be and Miles had a lot of orange. Creating your own avatar involved hair, eyes, smile, clothing, body color and shoes. I love that two players can play at the same time so my children don’t have to take turns, and I love that Zoe was trying very hard to do the actions. Some of the actions were a little bit too complicated for her to do. For instance, in playing Volleyball you have to go up and in the direction of the bull’s-eye. Even i had trouble making both movements. I did find that with practice though, it became easier and easier to accomplish the goal. There are quite a few different activities that you can do right away. I like picking one of the rotating activities that lasts a while. they are short and keep my kids attention and go from a running activity to volleyball, to baseball. Each activity involves movement. In total there are 11 exotic arenas/backgrounds to choose from and more than 15 sports challenges. It is fun and got all three of us through a rainy morning last week. Some of the activities you can use the Wii Fit with, and some of them require the nun chucks to be plugged in. The running activity requires you to have the controller in the left hand and the nun chucks in the right hand and you go up and down with your hands like you are running. You don’t’ have to run in place but I’m sure it’s a good thing to encourage your children to do and it will burn even more calories. Having two children that need to be more active than they are, I am so pleased that Jumpstart put together a game like this. Brook Burke is the trainer that shows you how to do each activity before it begins. You can practice with her before starting each activity. As a mother of 4, Brooke Burke knows that raising healthy kids means worrying about their minds and bodies. That’s why she’s teamed up with JumpStart to create a game that gets families up, active and healthy together! She’s discovered it’s the perfect way to teach her kids that fitness doesn’t have to be a chore. Access expert tips for more ways to stay healthy. Train with Brooke to make the most of every motion. Track calories burned to see your progress. Give me a tip on getting kids to be more physically fit. I received a free product to facilitate this review. All opinions are my own, JumpStart is also providing the giveaway copy. What Are Your Favorite Kodak Moments of The Year? For my daughter all I have to do is open the door. 😉 As for my son, I have to make everything feel like a game. Therefore, this would be great to help him be more active. Thanks for the chance to win! Have races with them in your own yard..
Give your children encouragement to join some form of sports. I think the best way to get kids moving is to help them find something to do that they truly enjoy. We like to make physical activity a fun family affair. Whether it be a bike ride or just running around the yard playing hide and seek or tag, we like to make it a priority every day. It’s not something to dread, rather it’s something we all look forward to. I get my kids to be more physically fit by taking them hiking on a different trail every week end. We do it every week as a routine. I Commented on the Father’s Day Breakfast Idea Buttermilk Banana Bear post. What I do to get my kids up and moving (besides going outside to play) we have a dance party. We turn on some tunes that have a good beat to them and move and groove away. I think the best get kids active tip is to do it with them. Then they’ve got an example, rather than someone telling them they should do something. Lead by example. Get outside and play frisbee, run races, etc. We all take karate together as a family…2x per week. take them to the park, what kid can resist running and playing at a park? My tip is to get kids doing fun stuff that helps them stay fit like bike riding and swimming! It isn’t difficult to get your kids moving, you just have to move with them. We ride bikes together, play catch, basketbal, and dance…we do at least one of these everyday. My children love when mom gets excited about these activities and jump right in with enthusiasm. My kids never stop moving, so I never have this problem. If they start watching too much TV though, I force them to turn it off. My kids enjoy visiting different parks and being able to play on the equipment. We pack a picnic lunch and just have a great afternoon. Go on family nature hikes. Buy your kids jump ropes and hula hoops. we get them moving by going for walks, and exploreing new things, when the weather is bad we play the wii!!!! I make sure that there are plenty of activites for the children to do outside. Luckily, they like to stay active. My tip: Start when they’re little, encourage them all the way that exercise is an important part of a healthy lifestyle. And show them through example! My son likes to play outside, but my daughter would rather sit around. I just try to get out with them, make it fun. Easiest way in the summer? Give them water guns and get them running! My tip is to go out and do fun activities with the kids! If you just tell them to go outside and play ball or something, they’re not going to be very enthused. But if you offer to go with them and spend time with them, this may excite them a bit more. I play silly little games with my girls to burn some of their energy, like jumping games, hula hooping, skipping, somersaults… my girls both love to do anything active like that! They love “playing” the Wii Fit with me, but it’s only one player and not for a 2 and 4 year old! I love that this is a family game that my girls can do together! One way to help the kids as well as yourself is to get out and play with them. Take them hiking every weekend to a different place. make a trip out of it. I Tweet or hit the RT button up top! Get them a bicycle and atke them swimming. It’s a great work out, it’s cool and fun. We take out son to the park everyday. I know some people don’t live near a park, but since we do, it is easier to get him moving. We walk there and play for at least an hour and then walk back home. Plus, it helps that our son can see the park from the bathroom window! a tip on getting kids to be more physically fit is to take them hiking every weekend. I tweet or hit the RT button up top often! I advertise this giveaway on facebook! Swimming, my kids love it!!! !